Because it happens to every foreign English speaker, my friend, that’s why! Do you think you’re unique in that your English fluency fluctuates? Common, you’re not the center of the world; there are millions of others who experience ups and downs of the ability to speak English fluently and effortlessly. The only difference between you and others might be that you’re being very conscious of your English fluency problems, whereas others would paraphrase, use small talk phrases and simply not get embarrassed if they get stuck in the middle of a sentence. But if you think that you’re not capable of mastering the aforementioned techniques and you’re doomed for a lifetime of constant struggle with spoken English…you have to understand that any process where a person’s learning and performance is involved is subject to fluctuations. Yes, ANY process involving human beings! We’re not machines and we can’t guarantee perfect performance at all times, and speaking is no different. Why, have you not noticed that you can’t even speak your own language every day at an identical performance level? Haven’t you noticed you have days when you just can’t seem to gather your thoughts and express yourself properly even when speaking with your native speaking friends? I definitely have, but it’s not because I would spend so much time speaking English that I’ve started forgetting my own lingo! It’s because of the simple reason I stated above – any human performance is going to have ups and downs. Even now, years after dealing with the English fluency issue, I do experience days when I’m a bit slow to respond. I do have moments of hesitation and inability to put my thoughts into the exact words I would want in English. Hey, the other day I even confused two words – “to reward” and “to award”! So instead of “contracts are being awarded to…” I said “contracts are being rewarded to…” A silly mistake, but then – who doesn’t make mistakes? As far as your overall English fluency is fit for the purpose – be it doing your job, studying, or socializing – you should not be overly concerned about your odd days when you feel a bit slower to respond. In other words, unless your English fluency is heavily affected and you don’t experience total blackouts when speaking (read a full list of English speech anxiety symptoms here), you’re fine. Anyway, let’s get to the matter of today’s article which is about the English improvement trend. So, what is it all about? Well, I assume that since you’re reading my blog you’re taking measures to improve your English on a daily basis. And even if you aren’t, there’s always improvement involved as far as you use English in your daily life. Even if you don’t make any conscious effort, speaking regularly alone is enough to hard-wire English into your mind stronger and stronger day after day. And all that definitely falls under the broad category of spoken English improvement. First thing you have to realize is that if you do use English as means of communication regularly, your spoken English improvement trend is always looking up. If I look at my spoken English level now and two years ago, I can notice a considerable improvement. I just have to watch the first videos on my YouTube channel to spot the difference! I believe it’s the same with every foreign English speaker, and you have to agree that it’s nothing extraordinary, right? Next thing – you have to realize that once your English fluency is constantly improving, you have to learn to ignore the inevitable setbacks. Even more – you have to embrace them expecting the upcoming peak in your fluency trend! To illustrate it better I drew a simple graph below, just have a quick look. 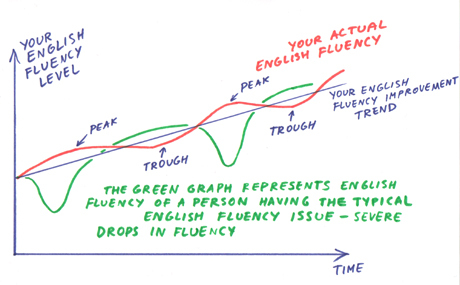 The orange graph represents your English fluency over time. As you can see, the overall improvement trend is going upwards, just as we discussed previously in this article. Of course, given that you regularly engage in spoken English practice; otherwise you won’t see your fluency improving to a great extent and the overall trend will remain flat or may even decline. Anyway, probably the most important piece of advice pertains the so called troughs on your actual English fluency graph. You have to have faith in yourself and your ability as a foreign English speaker. Once you KNOW that after a trough your fluency will go up again, should you really be anxious about your spoken English performance? You should be fully confident in your ability to speak English and stop wasting your mental power and time on worrying about those troughs – they’re natural part of ANY learning and improvement process. 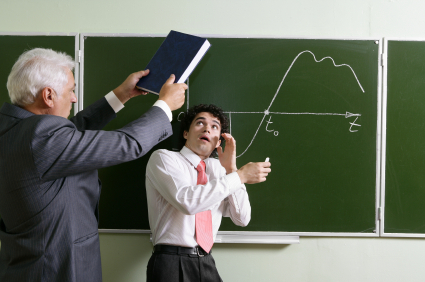 There are basically two approaches you can adapt when experiencing the down moments of your English fluency. You can attempt to PROVE to yourself and others that you’re a good English speaker. Well, you may even succeed because speaking fast is one of a number of strategies you can use to get rid of the mental block – I’ve discussed it at length in Step #1 of this article. But you also risk getting confused even more and I often find that when I struggle to speak clearly, it’s better to slow the speech down. This brings us to the second approach – letting it go. You have to go with the flow and if your mind and mouth want to perform somewhat slower today – so be it, don’t try to fight it by all means possible! ACCEPT it as a norm, and you can also comfort yourself with a thought that today’s English fluency trough is yesterday’s peak! Yes, try to look back on what your spoken English level was a year ago, and you’ll realize that back then you would have probably been happy to speak at the same level you speak today when experiencing somewhat slower and more hesitant speech! You can even take this acceptance one step further by understanding that you actually LEARN AND IMPROVE during the down stage of your English fluency. Let’s say, you’re sitting behind a desk at work and phone rings. You pick it up and it’s someone from the office asking you for an update on a specific order. You start explaining the issue, but you suddenly mispronounce a couple of words and you feel that something is wrong with the way you speak English. So what you have to realize is the following – it’s when you put conscious effort into repeating the sentence correctly that your English improves. Every time you make a mistake and correct yourself, you improve. I find myself a lot of times in this situation. The better way, as you said, is ACCEPT it, otherwise we got a very bad frustration feelings. I have experienced it many times. Thanks for write about it Robby! As always, a very well-written article… Thanks man.